The great state of Tennessee is a collection of stories, stories shared through song. With seven genres of music born in Tennessee (can you name them...? ), it's easy to see why it has become known as The Soundtrack of America. Made in Tennessee. We want to share the songwriters of that soundtrack that have been busy composing, pickin' and serenading on our front porches, in our local breweries and restaurants, and on the stages of our downtown festivals. Some have made it big. Some are still on the journey. Take a trip. Take a listen. Take a moment ... to celebrate our area songwriters during Tennessee Songwriters' Week, Feb. 17-23, 2019. See below for interesting local music history connections, and keep an eye on this page for special events, songwriter showcases, open mic nights and more to take place throughout the week in honor of local Tennessee songwriters. Garth Brooks (yes, THE Garth Brooks!) has strong musical ties to Cookeville. While celebrating his 7-diamond album accolade, Brooks named Cookeville as 1 of 7 most influential cities in Tennessee to impact his career, after signing with Capital Records following a 1990 concert at Tennessee Tech’s Hooper Eblen Center. Genre-bending band Judah & the Lion are now mixing melodies, banjoes, and more to create "Folk Hop 'n' Roll," recording in nearby Nashville aka Music City. Lead vocalist and songwriter Judah Akers grew up in Cookeville, and sees no boundaries when it comes to music. The native represents Cookeville wherever he goes, and even donned his old Cookeville Cavalier baseball uniform during a recent concert in his hometown. Note: All listings are Central Time Zone. * 8 p.m. Chuck Elliott Band at RED SILO BREWING CO.
* 8 p.m. Day Tripper at RED SILO BREWING CO. ATTENTION: LOCAL BUSINESSES, RESTAURANTS, BREWERIES, VENUES + MORE! How are YOU celebrating Tennessee Songwriters’ Week? 6 - Get creative! Find ways to highlight one or all of the 7 genres of music born in Tennessee (blues, bluegrass, country, southern gospel, rock ‘n’ roll, rock-a-billy, and soul). 7 - And … MOST IMPORTANTLY, share what you are doing with the Visit Cookeville-Putnam County team. 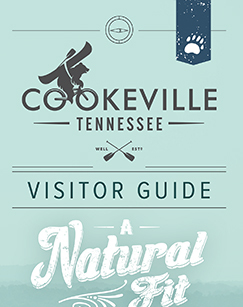 Share at info@visitcookevilletn.com, so we can spread the word!